A little about the owner: My father's parents operated Livingstone Lodge, a resort on Mascoma Lake in Enfield, NH for about 50 years, so innkeeping is in my genes. My mother's grandparents visited Ocean Grove every year for vacation, and my grandmother and her sister operated a B&B here for many years. Now that my grandson has wandered the Ocean Grove beach and dabbled his toes in the Atlantic Ocean, you could say we are a six-generation Ocean Grove family. I'd been coming to Ocean Grove all my life, and could not imagine a better place to move to when I retire from the University of Illinois. When a house just a few doors down from my mother's came on the market, I couldn't resist. The house actually was owned by my grandmother's cousin for many years (see house history), so it seemed right to bring it back into the family. I've remodeled the house extensively, updating it and furnishing it to be the kind of house I'd like to retire to. Until that day, I love to welcome families and other groups to my home to kick back, relax, and experience an Ocean Grove vacation. 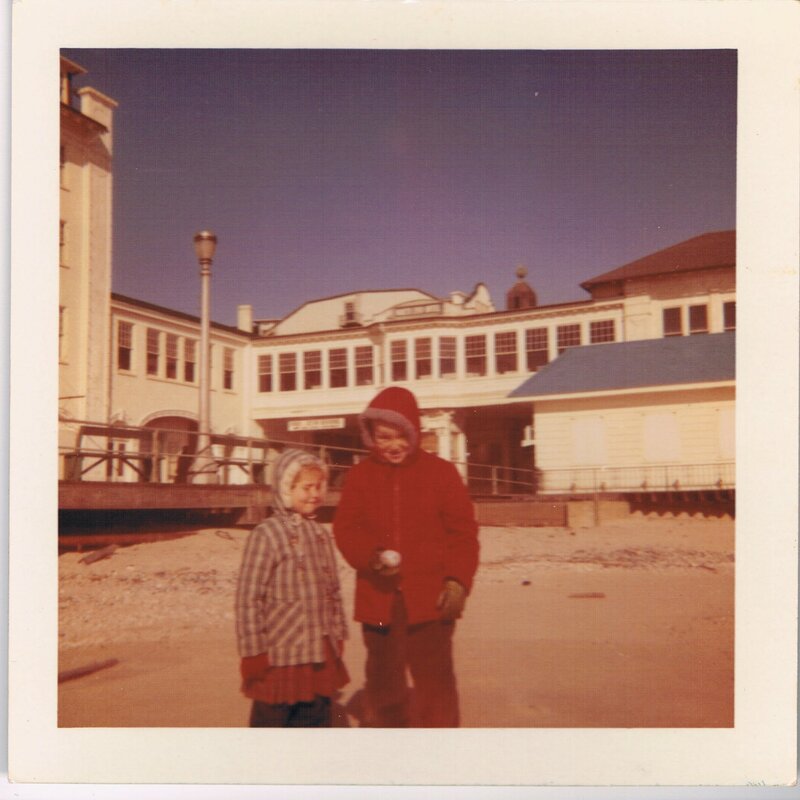 Here I am about age 7 with my brother Jim on a winter day on the Ocean Grove North End beach. Note the Homestead Restaurant and the North End Hotel in the background. The boarded-up area next to the boardwalk is the entrance to the tunnel to the pool and bath houses on the other side of the boardwalk.